Visit www.GrowIntoGreatness.com for the author’s bio, book excerpt, and photos. Orlando, Florida/ July 6, 2018 - Author, attorney and mother of 3 boys, Janet Autherine, is on a mission to empower children to see themselves as unique and amazing—already blessed with what they need to succeed in life and to achieve their dreams. On a daily basis, children are bullied into feeling “less than.” “The truth is every child matters. Every child is unique. Every child has been created with greatness.” Janet Autherine. Growing into Greatness with God teaches kids to recognize the greatness they were born with and to nourish the love, faith, courage, leadership, happiness, gratitude, and confidence planted within them as they learn to become their best selves. Referencing biblical heroes, and through actionable wisdom, offering practical ways to “grow into greatness,” this easy-to-read guide ignites hope in young readers and sheds light on their path to a bright future. JOIN OUR MISSION TO EMPOWER CHILDREN. Growing into Greatness with God: 7 Paths to Greatness for our Sons and Daughters is now available at www.Amazon.com and from all major booksellers. The second edition includes a journal and workbook that churches, parents, and Sunday school leaders can use as a teaching tool, and that children can use to document their Growing into Greatness journey. Read more about the author’s journey and join her mission to empower children at www.JanetAutherine.com. She is on Instagram @JanetAutherine. She can be reached for interviews or speaking engagements at (407) 793-9995. We love reading this book before bedtime! My daughter loves the bible stories and beautiful illustrations. This book makes a great addition to any family's book collection. Growing Into Greatness with God is a very inspirational and motivational read. A bedside must have, which can be read over and over, as you will discover nuances with every reading. I recommend this book for kids and adults alike! The book weaves the stories of the Bible into practical advice for our children. The topics are deep and meaningful, yet Autherine puts it in language that is easy for young children to understand. My 7 and 8 year olds read it to each other. I recommend it to any parent. This a beautiful sweet book that provides an opportunity for all to have a discussion with their children of any age about spirituality and the importance of developing a sense of greatness within! And it is a book for all faiths -- even those (like my family) who don't identify with a particular religion but want our children to grow up knowing that there is more to the world than what they can see and that they possess a strength and power within themselves! Thank you to the author! I use Growing Into Greatness With God as a devotional and quiet reading moment with my children. There are steps at the end of each section that you and your children can discuss and reflect upon. It's so good to see a book that tells the story of the Bible in a way that children can understand. It provides the foundation in which children can grow in their relationship with God, and in a way that they can relate to. Growing Into Greatness With God provides the applicable tools by which children can live by. It references great people of the Bible, how they live, and the choices they've made. It reminds children that they are children of God and destined for greatness. Great book! Autherine was born in St. Thomas, Jamaica, and immigrated to the United States when she was twelve. She grew up in Philadelphia and she went on to study at the Pennsylvania State University and Boston College Law School. After launching her law career, she was eventually drawn back to the sunshine, and she now lives in Florida with her three sons. Autherine continues to practice law, waking up at the crack of dawn to cultivate her writing. She is the author of 3 books, Growing into Greatness with God, Wild Heart, Peaceful Soul and the upcoming book, Everything’s is Irie: An Island Girl’s Approach to Mindful Living. Her juvenile nonfiction book, Growing into Greatness with God is inspired by her own experiences growing up in Jamaica and her goal of raising her sons to recognize and nourish what God has planted within each of them. Wild Heart, Peaceful Soul is a poetry book that tells the love stories of women through poetry. It all started in church. I gained my confidence in a little church in St. Thomas, Jamaica, called the Hampton Court Seventh Day church. That church was where I learned and recited bible scriptures, sung gospel songs and recited poetry. It is where I made some of my best childhood friends, picked cherries from the best cherry tree in town and listened to the sermons that inspired me to keep God the center of my life. My family's current church home is a wonderful methodist church in Florida. How does your new book relate to your spiritual journey? The book, Growing into Greatness with God, was born from those early bible study groups in church. The stories of young David (the boy who defeated the Giant), Daniel (a man who stood without fear among lions), Solomon (the wise judge) and Ruth (the loyal friend), as well as many others, all resonated with me. We were too poor to afford the latest toys and there was no television in our home so these characters became my heroes. We were poor but it didn't define our lives; we were rich in love, faith and community, and we had big dreams. Did you have any other sources of inspiration for your book? In the book, Growing into Greatness with God, the words of wisdom that accompany the stories are inspired by all the advice given to me by my mothers, grandmothers, aunts, uncles, cousins and all the "old souls" that entered my early life. I grew up in a house where family, faith, good food and hard work were celebrated. A two bedroom house housed 3 generations. It wasn't unusual for an 11 year old to walk 1/2 mile to fetch water before school, walk home, get ready for school, walk at least 1/2 mile to school, be respectful and attentive, participate in field day, take the long walk home with friends (not forgetting to stop and say hello to all the neighbors), pick fruit or dig yams for dinner, complete homework assignments, and end the day by having dinner and fellowship with family. That was my daily life growing up in Jamaica. I didn't fully appreciate it back then but I certainly do now. How was your transition to the US from Jamaica? In 1982, I moved to Philadelphia to live with my mother and my brothers. I had to adjust to a new country, a new household and the typical middle school anxieties. I was a shy, introverted child and I struggled to find my voice; it didn't help that my voice had a very strong Jamaican accent. For many years, I didn't speak up as much as I needed to - I feared saying the wrong words and getting into trouble; I feared being teased because of my accent; I wasn't familiar with the sound of my own voice. Fortunately, my upbringing gave me a quiet confidence. I was a good writer, a good student and I had a small group of good friends. I went to Murrell Dobbins High School, a vocational high school and followed the business track. With my typing and short-hand skills, I was prepared to be the best administrative support staff in Philadelphia. That was my plan B. College was not an option for me; it was a requirement. I always knew that I was going and when my older brother, Mark encouraged me to attend Penn State University, I jumped at the chance to follow in his footsteps. I connected with the Caribbean Student's Association, joined a vibrant church and happily settled into life in Happy Valley. It was there that I discovered that, at heart, I was a peacemaker. I ditched my Business major and chose Labor and Industrial Relations , a choice that would lead me to law school at Boston College- I discovered that I wanted to help people solve problems and a law school education enabled me to do so. What impact did law school have on your life and your writing? Why would an introvert go to law school? Those who knew me well were puzzled because they had visions of the typical loquacious courtroom lawyers from all the popular television shows. That was not my path; I wanted a job were I could be quiet, competent and effective. Boston College Law School, a wonderful Jesuit institution gave me the tools that I needed to find the voice that I didn't really realize that I had lost. I gravitated towards small classes with grades based on writing assignments. In a small-group class, I turned in a paper that I was really proud of; the professor commented that it was excellent but it was not in my voice. I hadn't spoken much in class so my voice was really a mystery. That is when I learned that it wasn't enough to let my writing speak for me, I had to let my voice be heard in all areas of my life. What is your life like presently? Growing into Greatness with God is about finding the unique talent that God has blessed you with, nourishing that skill and using it to be of service. My journey began in a small town in Jamaica and is being realized in the United States. It started with the wonderful bible stories that allowed me to believe that with God everything is possible. It began with the principles of faith, family, hard-work, community and bonding over good, healthy food. 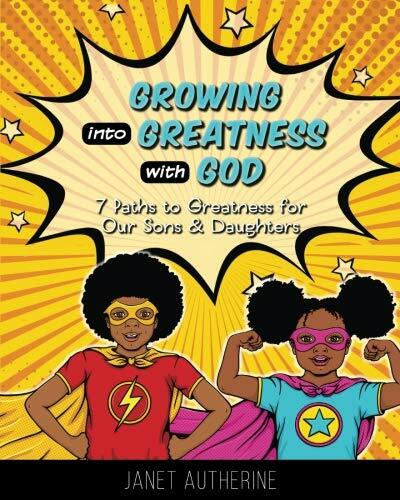 I hope that the book, Growing into Greatness with God: 7 Paths for our Sons & Daughter reflects those principles and that everything that I have learned on my journey, thus far, can help a child realize that he or she was born with greatness. Regardless of your circumstances, you can become all that God has ordained for your life. The journey continues.